It's time for another Bible character biography - and this guy is one who had some serious proverbial shoes to fill. He started out as a student of one of the best-known prophets of the Old Testament - and ended up making a name for himself in his own right. Elisha son of Shaphat first appears in the nineteenth chapter of the book of First Kings. His story is told there and in the book that follows, ending with his death in 2 Kings 13. 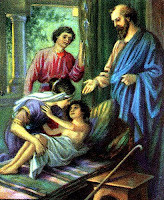 (And a miracle related to his corpse - but I'll get to that later) He is also mentioned in Luke 4:27. When the prophet Elijah went to anoint this man of God as a prophet, Elisha wasn't exactly doing the most "prophety" thing. He was plowing his land using twelve pair of oxen. He even drove one pair of them himself. (1 Kings 19:19) But as soon as Elijah threw his cloak over Elisha, he stopped working, got rid of everything related to his former work (1 Kings 19:21) , and began following this great prophet. There was no turning back for him. 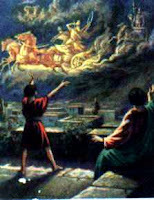 Before Elisha's great teacher disappears, he asks him for a double portion of Elijah's spirit. Elijah promises to grant it, as long as his mentee watches as Elijah ascends to the Father. Elisha does as he is told, and, as evidenced from his ministry following, the man received his wish. Between the time of Elijah's ascension and Elisha's own death, he performed many miracles - more recorded than his predecessor. He split the Jordan River (2 Kings 2:14), made bad water drinkable (2 Kings 2:19-22), multiplied a widow's oil (2 Kings 4:1-7), raised a boy from the dead (2 Kings 4:32-35), fed 100 with 12 loaves of bread (2 Kings 4:42-44), healed an Aramean army commander of leprosy (2 Kings 5), and more. His bones even performed a miracle (2 Kings 13:20-21) He also prophesied to Jehosophat, Ahab, Jehu, and Jehoash. This was a man dedicated to his calling. He spent years learning from one of God's most faithful prophets, then took what he learned and served the Lord diligently in his own right. Definitely a man to admire - and emulate. How are you like Elijah to someone? Elisha? What parallels do you see between these two prophets and being a follower of Jesus? It amazes me that even though Elisha had such big shoes to fill, he asks for a double portion...maybe he felt like it would take that in order to fill those shoes. His faith is amazing. Both these prophets amaze me - you know? Thanks for stopping by, sweets.